I’m sure by now nearly all of you have seen those cheesy, ubiquitous motivational posters/framed pictures during some span of your day to day life. More than likely, they are hanging up in your office or school, whatever the case may be. Why managers pay good money on these things, I’ll never know. Regardless, one of these posters caught my eye today at work. Luckily, I was able to find a picture of it on the net. Perhaps our collective managers have a sly sense of humor when assailing us with this, dare I say it, propaganda. 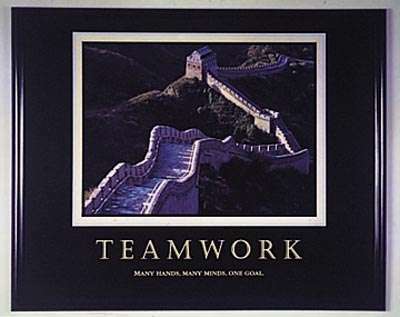 I say this because, well, the Great Wall of China pretty much represents the complete opposite of teamwork; unless you count slave labor, privation, starvation, mutilation, asphyxiation and just about any other ‘-iation’ as a definition of “team work”. During the Qin Dynasty, Emperor Qinshihuang (Cheen sure ha-wang) used 300,000 military conscripts and nearly 800,000 slave laborers to consolidate construction on what is now known as the Great Wall of China. It is not known how many died while building the wall, but estimates run into the hundreds of thousands. Many were “walled in” alive as punishment for minor infractions. Not that the death toll was shocking to those in charge. In fact, the “managers” of this colossal project made sure to bury the remains of the deceased in the ground under the wall. Hey, all those bones made the structure stronger, don’t you know. I, for one, would much rather our managers be a tad bit more honest with us. If you don’t like grand accomplishment that requires conscription and results in thousands of deaths, how do you feel about the US participation in WWII?